November has arrived, with the sun setting earlier and the chilly evenings to prove it. Now is the perfect time to take a look at your home and inspect what may need to be repaired, replaced or updated before wintertime. 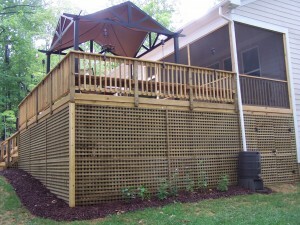 Treated wood lattice with doors for under deck storage. 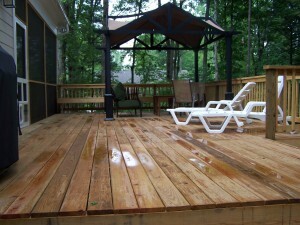 Wood deck treated with weather sealing. Clean and cover your grill before the winter chill. No one wants to be stuck in the cold scraping off grease and food remnants from their grill. Cross this one off your list early to also extend the life of your grill and grilling accessories. Check what’s above and below. Be sure to inspect the space underneath your deck, as well as any gutters and awnings above it. Reseal and repair. 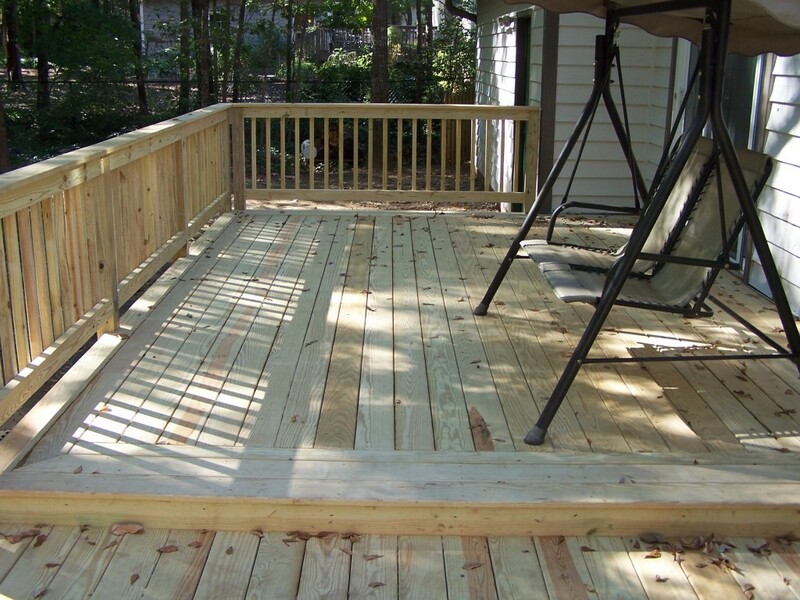 Go beyond simply cleaning your deck, and fix any damage by repairing or resealing old railings, steps or boards. Pack it away. Any furniture, planters or decorations that may discolor or wear over the winter should be moved indoors. Doing so will save you from needing to replace these items come spring. Salt vs. Sand. Avoid salt on your deck when preparing for snow, as it can cause damage. Sand is less likely to cause surface and fastener damage. Get a professional look. Having a seasoned deck expert inspect your deck for any signs of damage or hazards will ensure your safety through the winter and beyond. The professionals at Gerald Jones Company offer deck restoration and remodeling services to be sure your deck is in good shape for spring. Call us today at (919) 286-1700 to set up a time for your FREE consultation, or stop by our showroom in Durham, NC. This entry was written by Gerald Jones Company, posted on November 9, 2015 at 1:30 pm, filed under Uncategorized and tagged deck, home improvement contractor, winter home improvement, wood treatment. Bookmark the permalink. Follow any comments here with the RSS feed for this post. Both comments and trackbacks are currently closed.